To the right is the cover for the second edition of "Baraa'ah Ulamaa il-Ummah Min Tazkiyah Ahl il-Bid'ah wal-Mudhammah" (The Innocence of the Scholars of the Ummah from the Commendation of the People of Innovation and Censure). This book was prepared by Isaam bin Abdullaah as-Sinaanee. It contains a refutation of the one who used the intercession of Shaykh Bin Baaz (rahimahullaah) for Sayyid Qutb as a proof for the 'adaalah (integrity) of Sayyid Qutb and commendation of his (Qutb's) manhaj, when it is not a proof at all. The book, after compilation and authorship was sent to Shaykh Saalih al-Fawzaan who checked over it and made recommendations, and also suggested an improvement to the title of the book. Then it was read by Imaam Muhammad bin Saalih al-Uthaymeen (rahimahullaah), who made his own written notes on the pre-print copy that was sent to him, and he also advised that the section titled "The Salafi Manhaj", should be placed before "The Qutubi Manhaj" and not after it, unless the author had a specific reason for doing that. And images of these hand-written notes are included at the end of the book. We will be quoting from this book inshaa'Allaah in this series. Both of these scholars endorsed the contents of this book and the purpose for which it was to be published and distributed. And the purpose is clearly outlined in the title of the book itself. Namely, to declare the Scholars of Ahl us-Sunnah free and innocent (in particular Imaam Ibn Baaz, and the other scholars in general) of having made tazkiyah (i.e. given adaalah) to those who are from the people of innovation: In this case Sayyid Qutb, who aside from writing his commentary on the Qur'an upon an Ash'arite creed, added other great calamities, some of which are serious enough that they cannot really be excused by mere ignorance, such as accusing the Scribe of the Prophet (alayhis salaam) the Uncle of the Believers, Mu'awiyah - whose integrity is attested to by the Prophet himself - of treachery, deception and hypocrisy. And this book essentially sunk their ship, leaving them only the flotsam to hold onto thereafter, which is what they have been doing since then. Note: Whilst many of the biased-partisans use the word "Madkhali" as a derogatory phrase to attack one particular Scholar, everyone should realize that this is simply a cover and a veil. Their hatred and resentment goes way beyond just one particular scholar and it is towards the Scholars of the Sunnah in general for the the fact that the majority of them eventually spoke about Qutb specifically and the methodologies of al-Ikhwaan al-Muslimeen in general, after the truth became clear to them. The word "Madkhali" is used in a derogatory way that simply represents this hatred, resentment and jealousy. These people don't have a group of scholars that represent the manhaj they are upon. They have isolated statements here and there from some Scholars in isolated issues by which they cause confusion, but certainly they cannot point to a group of known major scholars and say, "Their manhaj in da'wah is the same as our manhaj in da'wah". By the way, Shaykh Ibn Jibreen who erred in defending Sayyid Qutb against those who refuted him has statements that contain refutations of these people. Be sure about that! Go and read this article and this article. So they have no Scholars guiding and leading them in their manhaj. And for this reason, they have to attack the truth with false labels in order to cut off the people from recognizing the overall broad methodologies that all of those scholars are united upon and which differ from the methodologies of the secular atheist Jews and Christians that Qutb and Bannaa innovated into the religion. As well as being in the book above, the following statement is also reeorded. You can download the audio recording here. 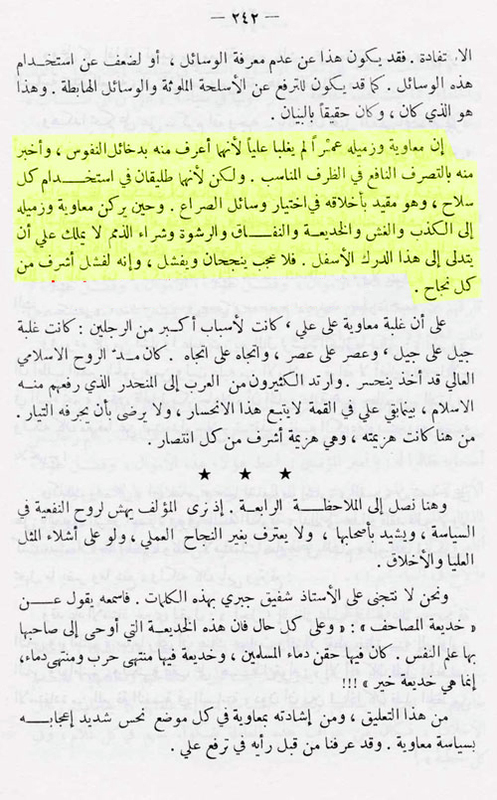 A section of the book "Kutub wa Shakhsiyaat" (p.242) was read out to the Shaikh and in which Sayyid Qutb accuses of Mu'awiyah and Amr Ibn al-Aas of lying (kadhib), deception (ghish), treachery or trickery (khadee'ah), hypocrisy (nifaaq), and taking bribes (rishwah). These are repugnant words!! These are repugnant words. Revilement of Mu'awiyah and of Amr Ibn al-Aas. All of this is repugnant and evil words. Mu'awiyah and Amr and whoever was with them made ijtihaad and erred, and those who perform ijtihaad and err then may Allaah pardon us and them. What about his statement that there is hypocrisy (nifaq) in them both, is that not Takfir of them? This is an error and a mistake which is not disbelief. For his revilement of some of the Companions or just one of them is evil (munkar) and sinfulness (fisq) and he deserves to be given exemplary punishment for it - we ask Allaah to pardon him - however, if he reviled most of them and declared them sinners then he would become an apostate, because they are the Carriers of the Revelation. When he reviles them then this means that he is reviling the legislation. Should not these books in which these statements exist be forbidden? It is necessary for them to be torn to pieces. Is this in a newspaper? In a book, may Allaah be benevolent to you. Source: The book "Baraa'ah Ulamaa il-Ummah Min Tazkiyah Ahl il-Bid'ah", by Isaam bin Abdullah as-Sinaanee, a compilation of the sayings of all the Scholars on Sayyid Qutb, checked by Shaykh Saalih al-Fawzaan. Originally from the cassette, "Sharh Riyaad us-Saaliheen" dated 18/7/1418H. (Audio recording here). Being resolved that they erred is not clearly apparent, but if it was said, "They were mujtahidoon, if they were correct they have two rewards and if they erred they have one reward, yet their error is forgiven", it would have been much better and more just.